I provide relaxing and restorative ‘Authentic Reflexology’ at my tranquil therapy space in a rural setting, at Rathvilly, Co. Carlow, over-looking stunning views of Mount Leinster and the surrounding hills. 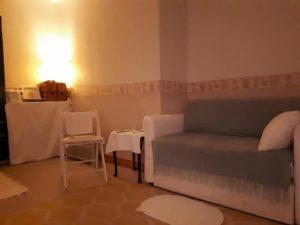 Alternatively, you can escape from the city din mid-week by availing of reflexology at my secluded therapy room at Dervish on Aungier St., Dublin 2. I also provide home treatments for clients for whom travel is not suitable or too stressful, this way my clients can relax more deeply in the comfort of their own homes. View my Carlow and Dublin locations for Authentic Reflexology therapy, home treatments and well-being workshops – LOCATIONS. Reflexology has been shown to restore balance to mind and body and improves circulation. There are many additional benefits of this pressure-based therapy, such as improved sleep, reduced anxiety, pain relief, calm and clear mind, comfort during grieving process, support and balance during fertility treatment and relaxation and relief during pregnancy. Reflexology has also benefited my clients who are dealing with illness such as M.S., M.E. and cancer. I work with mother and child, special needs clients. and I create well-being workshops for individuals and groups, all centering on self-care and empowerment. I discovered reflexology twenty years ago when I was starting out on my Authentic Path, a journey of recovery from anxiety, stress, bouts of depression and a lot of physical (menstrual) pain. I left a teaching career of Maths and Science and resolved to develop my creative talents of singing, writing and painting. This was my moment of Break True. I underwent a transition to being more mindful and began to see very real improvements in my health and well-being over time. Reflexology helped me to maintain calm during a period of transition in career and study and gave me more clarity of mind for making big life decisions. Eventually, I decided to study and practice reflexology so as to support others who want to improve their well-being and life experience, despite illness and challenge. I even wrote a book to encourage people with anxiety to move beyond that life-limiting experience – Seven C’s to Calm – Reclaiming your Anxiety-free self. I am also a qualified reiki master. While I acknowledge the energetic aspects of healing in my therapy, I have chosen to be a specialist in reflexology therapy. I am a member of Irish Reflexologists’ Institute Ltd., (I.R.I.L.) which means I am bound by professional standards and continuous development in reflexology. It also means my clients are able to recover some (or all) costs of treatment provided by their health insurers. ‘I have been feeling really good since my reflexology treatment, more energised and motivated. My tummy seems to have settled and I have fewer headaches’ – S.Lynch, Dublin, Ireland. ‘The reflexology treatments were helpful both physically and emotionally. Caroline is an experienced therapist with a friendly attitude and good advice, I highly recommend her as a therapist.’ – Hazel, Dublin, Ireland. Reflexology is the application of a variety of pressure techniques to specific points on the feet (known as reflexes) in order to release tension, improve circulation and to promote balance in body systems. These reflex points have been shown to correspond to organs and systems of the body. Reflexology is a holistic therapy which means that all aspects of the clients lifesyle, physical and emotional well-being are taken into consideration. There is evidence to suggest that the practice of pressure therapy, applied to the feet, has its roots in ancient cultures of Eypyt and China and of the Native American Indians. The term reflexology came more fully into use as a result of the work of Eunice Ingham in the early part of the twentieth century. Eunice Ingham developed the first foot charts, identifying reflexes on the feet that corresponded to body organs and systems. Her studies were a continuation of Dr. William Fitzgeralds findings with regards to zone therapy. ‘Authentic Reflexology’ – the reason why I use this name. I provide artwork and books for Authentic Path inspiration and well-being. Visit my gallery and bookshop for all details of how to acquire a gift for yourself or a loved one.